Ancient reference to the soul is ‘psychological’ in essence and not solely about a nebulous spiritual entity as modern parlance tends to assume. In this case soul equates to mind in the broadest sense, what it may be, how it may function, and how it may contribute to the human character. 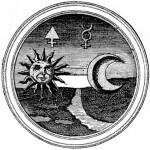 In astrological tradition, Moon and Mercury were recognised as principal arbiters of the mental and emotional faculties, comprising an essential mind/soul interface upon which the individual personality took form. Moon and the Mercury are the fastest moving bodies and those closest to earth in the Chaldean Order and in terms of the Soul’s Descent. They are most influential in stirring and moving things in the realm of matter, here on Earth. Even though they can be most adaptive and variable, they can become the basic significators of the soul on this plane – via character and mental disposition. Understanding the astrological condition of both may shed light on how the complexity of the emotional/mental faculties work. These functions contribute enormously to the sense of self and an apprehension of the cosmos. The qualities of a natal Moon and Mercury are geared to equip the person with resources, talents and abilities which truly mark the human being. And accordingly, their expression may be as varied and unique as the diaspora of individuals who comprise the world. The ancient philosophic view speaks of the ‘irrational soul’ and the ‘rational soul’. In astrology the irrational soul corresponds to the Moon and the rational soul to the Mercury. This is a complementary yet apparently conflictual juxtaposition which speaks of instinct/intellect, impulse/analysis, the subjective/objective, and other human ambivalences which take place in the psyche. To know something, Plato observes in the Theaetetus, is akin to capturing a bird and locking it away in the cage of the mind. But what happens when the thing we seek to know is the mind itself? The question has troubled philosophers for generations. Heritage astrology closely examines the state of these two ‘stars’ for an appreciation of the quality of mind/soul. In this Intensive the key roles of both this major luminary and the swiftly moving companion of the Sun will be explored. Their strength, power, mutual relationship, and network of influence will be assessed by employing a range of traditional craft technique. Then a considered judgement of their implications can inform the delineation of character and motivation. A selection of intriguing nativities will be presented to demonstrate these methods. This intensive (AP14) was first presented on the Gold Coast(GCAS) in August 2010 and in revised form May 2013.